There is broad consensus that the Somalia currency needs reform for a number of reasons. First and foremost, the current Somali Shilling lacks the basic characteristics of a currency. The shilling is not divisible — currently, Somalia has only 1,000 shilling notes (23,000 Somali Shilling is equivalent to 1 USD). And it is not easily portable because of its lower value. For instance, $50 equivalent Somali Shilling is 1,250,000, which is hard to carry in one’s pocket. Because of this indivisibility and lack of portability, the economy of Somalia is dollarized (with the support of mobile money). As a result, the 1,000 shilling note is increasingly obsolete, and unless it is collected and changed to a new currency, it could disappear in years. Second, monetary policy is not centralized as stipulated in Somalia provisional federal constitution. Some regional states and businessmen have their own printing presses and the Federal Government has no control of the money flow. Third, the dollarized economy is a huge burden to the poor families and small-scale businesses because they cannot afford to buy basic commodities in dollars. For these reasons, printing a new currency that is difficult to counterfeit is important for Somalia. When Somalia appealed for international support to print a new currency, Sudan paid the cost and printed billions of a new currency for Somalia in 2011. However, Somalis and the international financial institutions – International Monetary Fund (IMF) and World Bank – challenged the injection of the currency to the markets, and the currency was not transferred to Somalia. Although the recent results of the Staff-Monitored Program of the IMF are encouraging, many of the challenges that made the new currency plan futile in 2011 remain. The challenges that the new currency faces include political, security and bureaucratic predicaments. First, a successful change of a currency requires political consensus and agreement. Given the current frosty relations between the Federal Government and regional states, some regional states — particularly those with their own printing press — could boycott the Federal Government’s decision to print a new currency. This could deepen the political crisis. Somaliland, which declared its independence from the rest of Somalia in 1991, also has its own Somaliland Shillings, a central bank, and a functioning financial system. Without agreement on the status of Somaliland in a federal Somalia, the new currency will not be used in Somaliland. It could also mean a tacit approval of Somaliland independence. These political realities would be a major challenge for the introduction of the new currency. Second, security would be another obstacle for the new currency. The Federal Government does not control the whole country. 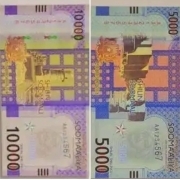 The new currency would likely not be permitted in areas controlled by al-Shabaab, and they may well threaten the businesses and the general public against using the new currency as they did in Beledweyne in July last year when a counterfeit currency entered the market. Third, the capacity of the Central Bank of Somalia remains weak. The human, legal and material resources of the Central Bank are limited. The bank is yet to show a capacity to regulate and manage commercial banks. The fact that the Ministry of Finance is taking an active role is also an indication of the capacity of the Central Bank. The Bank has no branches in the regions and does not have control of the currency circulation across the country. Fourth, printing a new Somali currency requires investment. Millions of dollars are required (the estimation is around $50 million) to be invested in the printing of sufficient currency. The entire 2018 federal government budget is $274 million. Somalia cannot afford it. Even if resources are secured for printing the new currency, a further investment would likely be necessary for mitigating the potential inflationary risks of the injection of the currency to the markets. The Federal Government of Somalia should be commended for its efforts to fix the monetary challenges. However, the decision to print a new currency should not be taken hastily. The incumbent Federal Government authorities should prioritize three things. First, the government should strengthen and empower the Central Bank of Somalia. Building the reputation and credibility of the Central Bank should be prioritized. A strong and able Central Bank with a clear monetary policy and capacity to deliver would help the government secure the trust of the public. Furthermore, a capable Central Bank would be able to regulate the use of mobile money and limit the transactions that can be made with mobile money. Second, the government has to show that it can handle security, and can enforce its decisions and policies across the country. A Federal Government whose presence and writ cannot reach beyond major cities should not inject a new currency, or risk creating parallel currencies that could further destabilize the economy. Improving security and strengthening relations between federal and regional security forces should be a prerequisite for currency reform. Finally, the Federal Government should prioritize political settlement with the regional states and Somaliland. Concluding a comprehensive constitutional review process — see our commentary on the constitutional review process— would represent a good first step in this direction. With the great & complete report you have presented is realistic and must be respected to all concern & stakeholders parties. I think, before any steps to be initiated & misrepresented news on currencies to the local civilians, would advise as the same as had elaborated. However, If not regarded the academical reviews – i think everything will remain on futile as it used to be. After 30-Year-of system and law absence of of Somalia & starting with currencies that have denominations 5,000 & 10,000 So. Sh. seems very disaster that culminates what has been going on that all started & remained incomplete.